The last couple of weeks have not been a good time to be a climate change sceptic. On 20 October the Berkeley Earth Surface Temperature Project (BEST), led by self-described climate change sceptic Professor Richard Muller, reported the conclusions of its independent assessment of land temperature records. Muller's team, which included fellow sceptic Professor Judith Curry, found that the BEST results agreed with those published by other groups such as NASA and the Hadley Centre in the UK which have found that global land temperatures have increased by a remarkable 1 degree Celsius in just 60 years. A week after the BEST team released its findings, Cardinal George Pell, Archbishop of Sydney, delivered a much-publicised lecture on climate change science to the Global Warming Policy Foundation, a think-tank in London that aggressively pushes climate change denialism. Although titled 'One Christian Perspective on Climate Change' the lecture had precious little theological content. Instead the lecture was centrally concerned with climate science. Pell criticised those who lazily defer to the consensus of scientists and set about himself to explain climate science, leaving the impression that he sees himself as a modern Galileo fighting against the scientific establishment. Yet what followed demonstrated a misunderstanding of the fundamentals not only of climate science but the scientific method and the history of modern science. 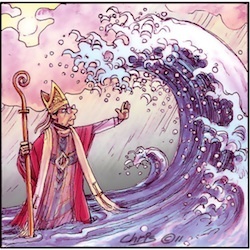 Pell's misuse of chaos theory and the invocation of the late Professor Edward Lorenz is particularly galling, given that Lorenz's insight that chaotic behaviour (such as the weather) may have predictable outcomes (climate) is at the heart of climate modelling. Even if we take at face value Pell's claim that it is a matter for the layperson to decide himself what the science says, surely as part of that decision-making one ought to consider what the mainstream science has to say, even if only to dismiss it. Pell does not refer to, for example, Professor David Archer's excellent book Global Warming: Understanding the Forecast (one of several used in science courses worldwide to teach climatology), or to any one of the many hundreds of articles on climate change published in the world's leading scientific journals such as Science or Nature. Rather, he simply repeats the sceptical talking points of prominent climate change contrarians Professors Ian Plimer and Bob Carter, and Christopher Monckton, only one of whom, Carter, has published a peer-reviewed article on climate science. All three have been repeatedly shown to have no credibility in climate science, frequently making wild and inaccurate claims. Lest you think this assessment of Pell harsh, bear in mind he has accused climate scientists of having 'fiddled with the evidence' in a reference to United Kingdom researchers whose conduct was confirmed to be entirely proper and scientific. Regrettably Pell seems entirely uninterested in the mainstream science. Not even the BEST conclusions merited a mention in his lecture, allowing him to repeat the untruth that global warming has stopped. His lecture is a collage of climate denial talking points that one finds on the weirder conspiracy sites on the internet. Reading between the lines, it is apparent from Pell's lecture that it is not an informed scientific view that is driving his understanding, but rather his politics. He clearly dislikes the Greens; I am with him on this for various reasons, including the fact that they support abortion and oppose nuclear energy. But ideology is no guide to physical reality, and political views should not drive scientific ones. Whether one is left or right on the political spectrum the same laws of physics apply, and it is those laws of nature that determine what is happening to the world's climate. Climate change science is like any other area of science, although it is one where there has been very considerable attention for a considerable period by a considerable number of scientists. The near unanimity of the conclusions reached on the rate and cause of recent warming is remarkable. In a 2010 paper in the Proceedings of the National Academy of Sciences by Professor William Anderegg et al., it was found that around 97 per cent of climate scientists actively publishing in the peer-reviewed literature supported the thesis that human activities are causing climate change. It is no surprise then that every major science academy including the Vatican Academy of Sciences have warned that the world is warming and that we are causing it. Other Church leaders have accepted this reality; the Archbishop of San Salvador, Msgr Jose Luis Escobar Alas, declared last week that climate change is the most serious problem confronting humanity. Climate science is complex and not explainable in sound-bites. Of necessity the layperson must defer to the experts. If Pell had offered views on neuroscience, quantum computing, immunology, the geology of Mars or any of the other topics covered in the latest issue of Nature we would rightly be scratching our heads at his intervention, unless he truly were a polymath of Galilean standing. But the discourse of climate change has become so debased and post-modern that any views, however bizarre, can be given an airing. Like homeopathy and astrology, Pell's pseudo-science should be ignored, and the scientific method allowed to continue, however unpalatable the conclusions may be. On the contrary, Pell is questioning the self acclaimed climate scientists who demonstrate their unscientific partisan qualities in not answering questions. If 'climate' conferences included debate and 'the other point of view' one could say they were open to questions. However their totalitarian desire to reshape the world is revealed in their inability to take on board a plurality of views and their denunciation of anyone who questions them. Good on Pell for daring the challenge the status quo. I beg to totally disagree with Dr Tim Stephens sentiments on Cardinal Pell's climate change Lecture. Indeed, the good Director collapses his argument in his second paragraph when he full agrees that "Climate science is complex and not explainable in sound-bites"
To begin with the so called climate change studies is based on satellite data that started being available just the other day when satellites became available. In fact,the scientists themselves are all in agreement that any other form of data is not as accurate or reliable. 1)Supposing for example the 1 degree temperature increase purportedly detected is a phenomena that recurs every 500 years, where is the comparative satellite data to prove or disapprove this? 2)Just to illustrate, the universal definition of climate is: the average weather conditions of a specific area studied for over 35 years. Hello, 35 years alone is a period longer than the period of time scientists have been testing the current global warming hypothesis. In my opinion, the current debate on global warming as an imminent human disaster is nothing more than the much publicized year 2000 computer crash (Y2K). If it isn't, then whatever research has been done so far to test the hypothesis is not only insufficient but unreliable. Good article. It says something too that Pell's climate science is of the same quality as his theology. I’d like to propose that at the heart of Cardinal Pell’s position on climate change is not so much merely political opposition to the Greens and others, and a purely political campaign to protect traditional church funding, but the same fear that animated the conservative establishment at the time of the Copernican and Galilean hypotheses: namely that to accept it might undermine the faith. Now, as then, what counts most is what he and his followers believe is the defence of a traditional theology of God and Man. If climate change is more than merely routine or cyclical, and mankind is capable of - and culpable for - the degradation and even destruction of the planet, then what are the implications for the theological edifice on which the meaning of their existence and ecclesiastical affiliations rely? This is the real battle-ground. The science is irrelevant. Dr. Judith Curry regarding the findings She said this affair had to be compared to the notorious ‘Climategate’ scandal two years ago. No-one who believes in a catastrophic man-induced climate holocaust believes in The Blessed Trinity. Climate Alarmists are getting desperate to try and make people believe in their mad idea of man-made 'end of world" scenarios. Thank you for a good article Tim Stephens, but why, oh why, do you have to have a go at homeopathy in your conclusion? As one who uses homeopathy almost exclusively for health care, and very successfully, with the humans, animals and birds in our household, I wonder if your condemnation is based on an informed scrutiny of evidence, or are you just "having a go"? Why is anyone in anyway surprised by Pell's position? This is a man who's whole life is based on an ideologically based position - one which is at complete oppposition to evidence, rationality and logic. He believes in sky fairies. Why should we be surprised that he follows that through with a further unscientific set of beliefs? Could you please now concentrate on what real scientists are saying about the issue - you know, the people who know what they are talking about - rather than uneducated (scientifically speaking), ideologically driven, people. If it is true that 97% of climate change scientists actively publishing in peer reviewed literature believe that human activities are causing climate change, this is not surprising because anyone of a contrary view is unlikely to be published. Tim Stephens criticises Cardinal Pell for ignoring reputable sources, but does he not do the same thing? The Age a few weeks ago published a story of a Nobel laureate who resigned from the American Physical Society (APS)on the issue of climate change, stating that global warming has become the new religion. He took issue with the certainy the APS attributed to the global warming theory, stating that such certainty is unscientific. There are different issues. Nobody to my knowledge denies that the world’s climate is changing. The current discussions are about the cause of such warming and the best way of dealing with it. It is evident that CO2 emitted in excess of natural absorption during northern hemisphere winters causes such warming. Countries responsible for the warming are major industrial nations in the northern hemisphere and unfortunately for them, the highest energy use (heating) occurs when there are virtually no active carbon sinks available to deal with the extremely high CO2 emission. It is unfortunate that these countries also have the highest population densities combined with the highest level of industrialisation. Whilst Australia is unlikely to contribute directly to global warming due to its low population and large active carbon sinks, it is exporting large quantities of fossil fuel to other countries. Australia has also a responsibility to care for future generations. Burning non renewable resources and wasting other resources is a form of delayed genocide. In this case we may cause starvation, poverty and death to our own future generations. The issue of “how” to control the waste of such resources and how to move towards a low carbon use economy remains the most heated part of discussions. Australia started doing lots of good things such as supporting better insulation of homes, rooftop solar PV schemes and conversion of cars to LPG etc. Sadly most of these efforts became nullified because of an explosion of new energy guzzlers in our homes (air-conditioning, plasma TV, tumbler dryers) The current Government has chosen the worst possible way to move towards a low carbon use economy. To appease the Greens and to remain in power, it agreed on a carbon tax. This tax will indeed have a negative environmental impact. Over 85% of the tax will be used in administration, self-promotion and “compensation”. It will NOT lead to any measurable agreed reduction, but it will reduce the disposable income of middle Australia. Most Australians will have less money for example to buy a solar roof PV system and hybrid cars may remain in the show rooms. It will also take away incentives for low income earners to do anything to change their energy use habits, as “compensation” will be paid. It will however make a new group of millionaires able and willing to exploit the system. Oh dear, the Cardinal's supporters have come out in strength. 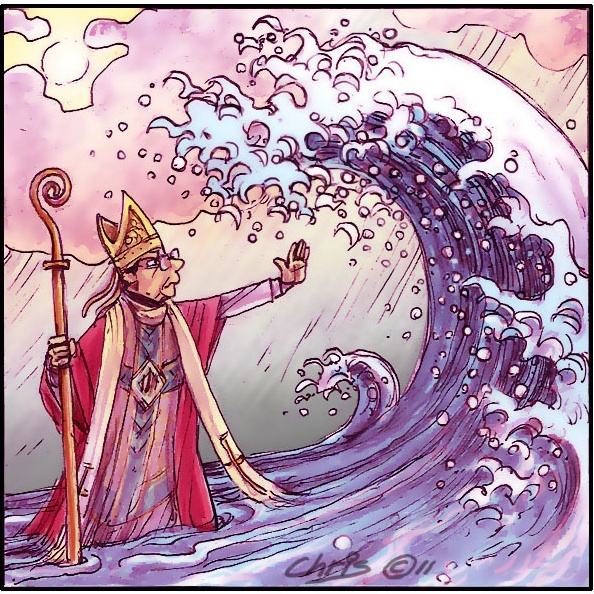 May I suggest that there is more evidence to support the proposition of human-induced climate change than there is for most of the theological propositions that the Cardinal holds so dear. I think Stephen Kellett's analysis is spot on - the idea that humans might be responsible for causing massive change in the physical conditions on earth is something that threatens to undermine some of the basic tenets in a faith based on a benevolent creator. And that was the real crime of Copernicus and Galileo. I'm told, and I have no reason to disbelieve it, that on a one-to-one basis Cardinal Pell is a charming and gracious man. And I believe that in his public pronouncements, whether from the pulpit or in the city square, he is motivated by a sincere desire to spread what he believes to be true and to correct what he believes to be false. Unfortunately so much of what he claims to be the truth is sheer dogmatism. And so much of what he condemns is his misconstruction of what others (e.g. The Greens) are saying. Of course sometimes he hits the mark, as for example his warnings against the dangers of socail clubs over-dependence on poker-machine revenue. Although even here he seems to be reluctant to admit that The Greens have pokies reform as part of their social reform package. I read his climate change lecture and quite liked his argument in favour of governments exercising prudence when it comes to imposing a monetary sanction on big polluters because it will hit the most vulnerable in the long run. Archbishop Alas has pointed out economic considerations makes getting people to take action on climate change a huge challenge. No-one who believes in a catastrophic man-induced climate holocaust believes in The Blessed Trinity, declares Trent. Declarations about who and who does not believe in The Blessed Trinity are one thing, listening to The Blessed Trinity is another thing altogether. There aren’t many people in the world eagerly looking forward to a catastrophic man-induced climate holocaust, none at all that I can see. That doesn’t mean that it won’t happen and how we understand what we must do next in this context begins by listening to The Blessed Trinity. Personally, I would be careful about declaring what other people believe or do not believe on their behalf. I find it a great shock sometimes to discover who believes in The Blessed Trinity, it certainly is a broad and ragged range of humanity. Sadly, climate deniers are more a more predictable lot. Ostriches not only cannot see with their heads in the sand, they cannot listen either. Cardinal Pell is like every member of the community perfectly entitled to form his own opinions on climate change. What really worries me in this instance is that in persistently using his position to publicise his views on a subject on which he has no claim to speak with authority he is undermining his credibility to speak on subjects on which he does indeed speak with authority. "Pell criticised those who lazily defer to the consensus of scientists"
Pell demands his sheep-like followers to 'lazily defer to the consensus of Bishops'. Yes, Pell would know as much about climate science as the milkman's horse would, clever though Dobbin is. "Even if we take at face value Pell's claim that it is a matter for the layperson to decide himself what the science says", funny how Pell and other religionists fight so hard to keep Religious Intrusion classes in public schools then. Why not 'leave it to the laystudentperson' to make up their own mind about Pell's form of god? It is difficult to understand how one so educated as Cardinal Pell does not recognise science as a specialist field, in which trained people build on prior knowledge to develop theories to explain new phenomena. To this extent, science is comparable to theology, a field in which many of us would like to believe the Cardinal has some expertise. However, unlike theology, the slow incremental growth of science depends on the clear majority of empirical evidence supporting any new theory. In most fields of science, there is some empirical evidence which does not support the theory. Science is always a work in progress, the door remaining open to further evidence which might generate alternative theories. As a citizen, Cardinal Pell has the right to argue against any political policy proposed on the basis of current scientific theory. He also has the right to disagree with any current scientific theory, including climate change. However, his public assertions that 97% of climate scientists are incorrect in their field reduce his own credibility, thereby damaging his reputation as a senior church leader. The Catholic Church in Australia is not well-served when its senior prelate demonstrates so little respect for the expertise of others. Michael Taylor clearly explains why some Catholics criticize Cardinal Pell on his stand that humans can not change the climate. Cardinal Pell knows that the climate has changed over the years. The real reason "is Cardinal Pell's theology". His total loyalty to the Pope and the Magisterium. Liberal, progressive, modernist and other Catholics want to change the teachings of the Church to suit their way of life. Thank God, with new leaders and a young generation including the whole Catholic Church in Africa and Asia, Catholicism is flourishing and will last another two thousand years without any radical changes that has destroyed the Church in Europe. AMDG. Nobody disputes that “global warming is real”, at least from about 1970 to 2000 – but even BEST shows warming has halted for the last decade, and on prior form that cresting of the curve heralds some decades of global cooling. For prior to 1970, “global cooling” was real for about 30 years, and prior to that warming, and prior to that cooling, in a multi-decadal pattern. Likewise nobody disputes that temperatures have trended upwards a degree or so from well before the industrial revolution – because that is what the climate system does if coming out of a little-ice age. Recent fluctuations have been often repeated and exceeded in the past – so why the excitement about our present unremarkable times? Cardinal Pell is right to be suspicious of evangelical (indeed inquisitional) ardour in climate science. Only the naïve can fail to see the global politics at play here, with those who would bureaucratise the earth recognizing the carbon panic as their main chance; nor should we be blind to the deep spiritual appeal of eco-pantheism to a generation which has lost its religious bearings. There is plenty of motivation here for the corruption of science in pursuit of “higher” goals. I agree with Tim that it's politics, not rationality, that drives Pell. Pell is anti-left, particularly the Greens, and therefore sides with the right who won't accept that global warming is caused by us. Because to accept that, means accepting that markets can fail and only government ('Big Government') action can save the day. You'd have to be kidding, Trent, to expect us to consider articles in the Daily Mail as good sources of scientific knowledge. Watch the TED talk by Ben Goldacre "Battling Bad Science" to get an idea of the Mail's standards of scientific rigour. Just the first minute is sufficient though the rest of the article is both fascinating and frightening. The problem here is that a poor understanding of science and how it works, and an even poorer understanding of how theology can inform and shape debate means that neither of these ways of knowing truth are taken seriously in the public arena. What is left is politic and personal opinion. Science does not work on personal opinion and neither does good theology. The problem with Cardinal Pell's understanding of climate change is that he both undermines the authority of Science to help us understand the physical world, and undermines theology's search for metaphysical truths. His waging into the debate ensures that these over lapping magisteriums appear even more further apart. His contribution is neither enlightened nor helpful. The level of hysteria and determination to contradict overwhelming scientific evidence, demonstrated in some of the comments on this page is truly depressing. To Kevin Prendergast and Skye: It wasn't always 97%. When this first started being debated, it would have been argued from both sides - in the late '70s, there was a feeling we were headed for cooling rather than warming. But gradually, it has become 97%. Why do you think that happened? Because those experts who originally questioned the theories became convinced of the arguments of those experts proposing them. That's how science works: evidence mounts up to support the theory until it can no longer be ignored. It was the same when quantum theory was first proposed: scepticism and argument (including from Einstein) followed by a cycle of debate, refining the theory and checking the evidence followed by gradual acceptance. You can be paranoid about conspiracy theories if you want. I'd rather be cautious and leave something for my grandchildren than ignore it all and leave them a resource stripped wreck. Thank you for this article. I am appalled by George Pell's partisan intervention on this issue. He does great disservice to thinking Catholics everywhere. Challenging the status quo on science should only happen using credible science. He is no scientist.
" He clearly dislikes the Greens; I am with him on this for various reasons, including the fact that they support abortion and oppose nuclear energy"
- the risk of major and catastrophic accidents. Much better to invest in developing solar power and its storage and transmission. I don't know whether to laugh or cry at some of the ignorance displayed in these threads. The usual parroted litany of myths and disinformation that have been debunked a thousand times before. Where to start with only 200 words? Maybe to point out the extreme irony of someone claiming to be a "skeptic" and in the next breath citing "The Mail" (of all places) as a source of information! Almost as ironic as citing the failed "orchestrated smear campaign" that was the so-called 'climategate' fiasco. No matter that no fewer than SIX independent inquiries in both the UK and the U.S. have consistently utterly vindicated the science and found that the scientists simply "Have no case to answer". No matter that the latest BEST analysis has shown that HadCRU underestimated temperature rises. No wonder WUWT and "The Mail" have been working overtime lieing about what Judith Curry actualy said - go to her own blog and compare her words with what the denierblogs and 'newspapers' claim she said. That the Earth is warming IS indisputable. It is also indisputable that there are no known natural cycles that can be causing it. If there (is) real hell, whoever that lies to go, then people should say the truth! There is no records of natural factors but only human activities - at least piling up for decades. Well, who can show the natural causes behind the GW? The fact is there are local events occurring globally that local temperatures, in general, are beyond normalcy. That's true it could be colder one day, one month or a year locally but warming up globally. This is what I know. When a scientist disputes global warming alarmism, he/she is promptly asked "Are you in the pay of Big Oil?" When a scientist affirms global warming alarmism, they are never, ever asked "Would you lose your position/funding if you challenged the global warming consensus?" Of course many of them would, and a few brave ones have. Apparently "follow the money" applies only to one side of this dispute. I can't work out which is more outrageous here: the double standards of the media, or the gullibility of the general populace. I think that Stephen Kellett's observations constitute the real 'sleeper' in this conversation. Even if Pell could claim half of the scientific evidence against anthropogenic involvement in climate change as correct, his views remain just that, half right. Stephen cuts clean through all of this by naming the subtext of Pell's views both theological and ecclesiastical. Cardinal Pell, like other heavy hitters of evangelical doctrinal orthodoxy such as +Chaput of Philadelphia and +George of Chicago, are doing their theology out of a paradigm of ecclesiastical introspection and resistance to the kind of healthy external critique of Church traditions and belief systems which was the gift of the Renaissance to intellectual integrity. These Hierarchs, like Benedict XVI, believe that the platform of the New Evangelisation of the world consists largely in providing clear and certain answers to questions that the rest of humanity is not asking. Good Catholics all, surely you believe in Sodom and Gomorrah! "That the Earth is warming IS indisputable." Yes, LG, and for the umpteenth time, you'll be relieved to learn: skeptics (and Cardinal Pell) don't dispute the warming, as a weeny bit of googling will attest. Tell me: why are warmists so eager to attack straw men? And when you say "It is also indisputable that there are no known natural cycles that can be causing it. ", how does that square with your authority, Judith Curry, who says this of the latest warming pause: "This concept of a recent pause in the warming seems to be fairly widely accepted by many mainstream consensus scientists."? Given that CO2 levels have been increasing steadily over this time and are at historically high levels, what is the "indisputable" account of this pause, that meshes with the account proffered by global warming consensus? And if there isn't one (peer-reviewed of course and agreed to by a "consensus" - the usual parameters) you can readily refer to, doesn't this suggest that the received narrative is not quite as set in stone as it is proclaimed to be? The author repeats the misconception that Muller is a skeptic. In fact, in an interview with the Huffington Post, he admits to being puzzled by these labels. How does Stephens consider a degree of warming over half a decade to be significant? This is consistant with trends before human fossil fuel consumption was significant. "Bad week for Pell and climate change deniers" ? To the contrary, Stephens is consumed by his CAGW religion. The BEST papers are receiving a considerable shellacking from knowledgeable climate scientists on both sides of the divide. It is unfortunate that the MSM does not provide any coverage of the contrary views leading to the assumption by the warmistas that the 'science is settled'. It is a travesty that such censorship of opinion exists and underpins the great uncertainty that vexes climate pseudo-science. That the Earth is warming IS indisputable. It is also indisputable that there are no known natural cycles that can be causing it." You should provide a credible source for these statements. [url]Here's a simple place to start. please follow the links. Thank you kindly. As an atheist whose left-wing outlook is influenced by Marxism, I defend George Pell's right to express a view on climate change. If it is acceptable for individuals such as Al Gore and Tim Flannery (and Tim Stephens) to express their views through the media - none of whom is a climate scientist - then I fail to see why it should not be acceptable for non-climate-scientist Pell to do so. The UN's IPCC in its fourth report found a global warming of less than one degree since records began in the late C19th. And please, don't tell me they're all paid agents of the fossil fuel industries. It is right to rebel! BRIAN FINLAYSON notes: "I'm not sure that the BEST results even have the full support of the authors. See: http://judithcurry.com/2011/11/04/pause/#more-5671"
The BEST study was an attempt, funded by Rupert Murdoch's second-best friends, the petrochemical billionaire Koch brothers, to find evidence that the instrumental temperature records compiled by groups lead by James Hansen and by Phil Jones are somehow faulty. So what did the BEST study find? Well, it could find no problem with the work of NASA's GISS group lead by Hansen, and UK Met Office's Climate Research Unit lead by Jones. Of course we will see BEST group members such as Judith Curry, who have made their careers out of climate change Denialism, continue to Deny. What the BEST results show, however, is that the protestations of people like Curry are baseless. They are not meaningless, however. What they mean is that people like Brian Finlayson can remain in their Fools' Paradise, and continue to vote and behave in ways detrimental to the interests of their own children. Typical warmist article.No mention of the lack of warming the BEST team found in the last 13 years.Nor any mention of the fact that Muller makes no comment as to the possible cause in the 1 degree warming.Professor Curry on the BEST team even says it's time to start looking elsewhere for cause of the warming other then co2.This Sydney warmist might be ready to give the climategate boys a not guilty verdict ,but most people agkowledge that the climategate enquiry was a complete whitewash.Please remove your blinkers Dr Stephens and try and forget the the first warmist commandment "Thou shalt not doubt AGW......ever"
Very good article. I am amazed at some of the commentary. Just wanted to make a quick observation that people who wouldn't dream of second guessing their GP or priest on matters of their expertise see fit to critique the arguments of those who clearly have the knowledge or experience to comment on a particular area. Why are climate scientists and environmental lawyers subjected to censure but not other experts? You call this love, save the planet or else? I can’t do this anymore. I can’t condemn my children to the Greenhouse Gas Chambers any longer just to make them more environmentally aware and to turn the lights out more often. Now we use climate change as a catchall phrase for environmentalism when it’s really a CO2 death warrant to billions of children. What part of catastrophic climate crisis do you not understand people? This fear mongering of the CO2 mistake is thankfully coming to an end and this planet lover is happy, not disappointed that CO2 science was a tragic academic exaggeration. All we had to go on was the world of science and science gave us pesticides don’t forget so if any of you really believe in the worst disaster imaginable, climate crisis, at least start ACTING like it’s a climate crisis and march with you’re THE END IS NEAR signs like the other bible thumping freaks. Pollution is real, death by CO2 is not. "Hopefully, most thinking Catholics would realise that the cardinal is not speaking on behalf of the Catholic Church". Hang on, Pell works for God, via the Pope and Vatican's authority to have him as a Cardinal. Pell has no private views in this position, any more than the Pope has any, or say, the Queen. Can you imagine the Queen ever offering a 'private' view? So it is when you consign your body and mind to the gods. Your right to a private personality and private views is gone. Make no mistake about Pell, he speaks for the Roman Catholic Church here in Australia, with full authority from Rome. If that is not the case, do we see any moves to silence his outbursts of Hansonism (or Jonesism) from Rome? Nice touch David Van Gend,"Cardinal Pell is right to be suspicious of evangelical (indeed inquisitional) ardour..."
If only 'others' were equally suspicious of all this 'evangelical ardour', eh? Or those that display it so frequently. "However their totalitarian desire to reshape the world is revealed in their inability to take on board a plurality of views and their denunciation of anyone who questions them." Sky, I wonder if this quote could equally apply to C.Pell and those others who want back Vatican II. Perhaps Cardinal Pell should read the statement issued by the then Pope John Paul the second dated 1/1/1990 called "Peace with God the creator, Peace with All of creation". In it, he states "We cannot interfere with one area of the ecosystem, without paying attention to both the consequenses of such interferences i other areas and to the well being of future generations". The pope mentions the depletion of the ozone layer, the related greenhouse effect and the burning of fossil fuels among other items. George seems to be at odds with the Popes statement here. I think Pell would do well to read the whole transcript of the Pope's statement and then think before he engages his mouth. Cardinal Pell is prepared to publicise his inexpert opinion on climate change but remains silent on social justice issues such as asylum seekers and corporate greed. I don't know how Cardinal Pell interprets the life of Jesus but I'm sure it's very different to the way I and many others do. The evidence for human caused global warming is now so overwhelming that the only people who deny it are either liars or fools. As a committed Catholic it is embarrassing and depressing to have to decide into which category the Cardinal falls. Dan said "Anderegg surveyed 1372 scientists actively researching in climate science and found 903 accepted AGW and 472 rejected it." Absolute rubbish Dan. He found exactly the opposite of what you claim. Here's a link to Anderegg's work. http://www.pnas.org/content/early/2010/06/04/1003187107.abstract If you can't be bothered going to it, here's the key part of the Abstract: "Here, we use an extensive dataset of 1,372 climate researchers and their publication and citation data to show that (i) 97–98% of the climate researchers most actively publishing in the field support the tenets of ACC outlined by the Intergovernmental Panel on Climate Change, and (ii) the relative climate expertise and scientific prominence of the researchers unconvinced of ACC are substantially below that of the convinced researchers." you should change your assertion that GWPF aggressively push climate change denialism as this is completely wrong. They certainly do not deny that the climate changes, they also do not deny that there is global warming (see their response to BEST). They argue against a centralised and interventionist state policy response. That is why they decided to put the P into GWPF so that nobody could misunderstand their position except willfully so. I'm sure the warmists will be highly relieved as recent science continues to allay their worst fears: "a paper soon to appear in Science magazine concludes that the climate sensitivity—how much the earth’s average temperature will rise as a result of a doubling of the atmospheric concentration of carbon dioxide—likely (that is, with a 66% probability) lies in the range 1.7°C to 2.6°C, with a median value of 2.3°C. This is a sizeable contraction and reduction from the estimates of the climate sensitivity given by the Intergovernmental Panel on Climate Change (IPCC) Fourth Assessment Report (AR4), in which the likely range is given as 2.0°C to 4.5°C, with a best estimate of 3.0°C." Only 2.3°C? That's just what I thought would be an ideal temperature - up there the Medieval or Roman warming optima, when civilizations flourished. Let's double our CO2 asap! PH,if the 'Science' paper I cited is right (of course, no guarantee - science is always tentative), then the IEA thesis is wrong, no? "New study shows temperature in Greenland significantly warmer than present several times in the last 4000 years"
And for neophytes: note the contrast between 1) the substance of this paper's empirical work itself, and 2) the hilariously mandatory - but thoroughly adventitious - disclaimer at the end, which nevertheless guarantees it will be published at all: "Notwithstanding this conclusion, climate models project that if anthropogenic greenhouse gas emissions continue, the Greenland temperature would exceed the natural variability of the past 4000 years sometime before the year 2100." To further understand 2), watch "Yes Minister" - "The Greasy Pole". In particular, the discussion between Lord Crichton and Professor Henderson at the end. No further explanation necessary. Careful please! Our good Cardinal Pell might not be a climate specialist which he himself would readily admit. To state however that " The uncomfortable truth" has been found is also to say the least very doubtful. The basic problem is that we (mankind) need more and more energy and haven't found yet a satisfactory replacement for our fossil fuel source for that yet. Whether the CO2 we produce really has the alarming effect doomsday effect???? It was many many times higher than now in the ice ages. SO??? Pell has every right to question the controversial topic of climate change,just as Galileo had every right to question the cosmological explanation of the time. Science has become politicised and those who dare question the ideological science of climate change are deemed heretics. What an interesting reversal from former centuries - in this case Pell is holding up the beacon of reason and scepticism and speaking up for those who do not have a voice in the face of the mutual back slapping hysterical 'consensus' given in mellifluous tones of voice as if serious mutual nods guarantees 'facts' and as if science was ever about consensus. Ever hear of Wittgenstein, Kuhn an Polyani? Pehaps time to revisit their writings? It is good to see Pell being taken to task within his own Church. It is sad that the dark shadow side of Christianity becomes so exposed, but then that is why the shadow exists. When cardinal Pell spoke on climate change earlier this year he expressed the same view.His opinions on this subject are ideologically driven.They have no basis in science or reason. His views on climate change are a "dog whistle" to the conservative politicians tht he is leading the Catholic vote to their side of politics. All the peer-reviewed evidence and counter-evidence proves that the science is not settled (whatever "the science" may mean - it seems to mean different things to different advocates). To complicate matters further, there has been a 33% increase in CO2 emissions since 2001 but virtually no increase in global temperature over that period. http://www.forbes.com/sites/jamestaylor/2011/11/09/carbon-dioxide-emissions-up-sharply-yet-temperatures-are-flat/ But, for all that, I would think there is good reason to move on from reliance on fossil fuels. It's a pity that green alarmism obfuscates the good reasons for moving on, regardless of whether the planet is warming dangerously or not. Fossil fuels will become scarcer and more expensive due to greater demand (from China, India and eventually Africa) so it would make sense for governments to invest in new technologies, creating energy resources that allow us to build a better society based on the old left-wing slogan, "Abundance for all" (rather than the green preference for austerity through sustainability). Nuclear fusion is the best direction and Australia could be part of an international effort in this field, rather than just continue funding green entrepreneurs for political gain. There are three propositions in question. Firstly, is global warming occurring? - probably. Secondly, to what degree has human activities contributed to global warming? - not sure. Thirdly, can human activities reverse global warming? - No-one knows. It is this third question in particular that is not addressed adequately by scientists, politicians and the media. Pell's comments in relation to this third question ask is it reasonable and justifiable to threaten the economic well being of individuals or a nation by initiating new taxes if we have not demonstrated that human activities can reverse global warming? Do the measures suggested by climate change advocates to make us better stewards of nature unfairly impact on our duty to our neighbour's wellbeing? This to me is a more pressing question for a social justice blog than the "science" itself. Whilst a 97% consensus of scientists might be comforting let us not forget that science ultimately is based on empirical evidence. Also even if 97% of scientists agree that human CO2 emissions are greenhouse in effect and causing some global warming, the real question is 'how much' when normal natural factors are still operating. There is no 97% consensus here. Read Prof.Bob Carter's book, 'Climate Change - the Counter Consensus"! •	the risk of major and catastrophic accidents. Having listened to a convincing argument by a CSIRO scientist who recently spoke privately, it appears solar power has the best long term case. However, until recently, when I thought of nuclear power, I thought of uranium, and I absolutely agree with your points above, but they are based on uranium technology. On the other hand, I have since been enlightened about thorium being a much better alternative nuclear power source, which overcomes the above issues. I read that the primary reason uranium reactors were developed was because the waste product was useful for weaponry. Thorium may be the answer in the medium term; Australia has some of the largest reserves in the world, depending upon who you believe. May I , as an Irishman living in China, intrude in this debate ? My dear Australian friend, Pat Lynch, gave me this link and viewing the Canuteesque cartoon was drawn to following the thread. I found the article interesting until the penultimate paragraph where the author, in a throw-away remark consigns homeopathy and astrology to the rubbish bins of Life.Immediately his credentials and claim to be trusted, as a reliable source,are drawn into question.It is somewhat akin to the argumnetum ad hominum of one who has lost his way and lashes out blindly. " When on the horns of a dilemma throw dust in the bull's eyes"..."zen and the art of motorcycle maintenance." "The Science"..with the deification of science we seem to have lost sight of the fact that science, by its very nature, is merely another form of archealogical discovery of what already exists and it creates nothing...it is an enumerator. All the great discoveries are merely, like a child playing in a sandbox, discoveries of what already exists.Galileo did not cause the earth to be round. Quantum physics has always been. Nuclear fission exists.Science is not God but rather an abacus for His children. Thank you Dr Stephens for another excellent article. Those confused by the reams of half-truths and misleading statements in the comments can check out where the peer-reviewed science stands on an award-winning site run by another Australian Christian: www.skepticalscience.com. There are still plenty of live debates in climate science, but they do not include whether the climate is changing, whether human activity is presently the major cause or whether the changes will be beneficial, harmless or dangerous. All these questions have strong agreement between all basically all experts. The real debate is whether our current trajectory is catastrophically bad and threatens the prosperity and stability of our present civilisation, or much worse than that. The Anderegg survey has been criticized on a couple of grounds that I think are reasonable: for its dichotomy of 'convinced' and 'unconvinced', which does not allow for the surveyed scientists to commit to a nuanced view, and also for surveying too many climate scientists who were unqualified to address the issue of attribution. The surveyed scientists were asked to commit, or not commit, to one proposition: that humans were responsible for most of the change. Climate scientist Judith Curry (co-author of the BEST report referred to in Tim's article) says: "The climate experts with credibility in evaluating this statement are those scientists that are active in the area of detection and attribution. “Climate” scientists whose research areas is ecosystems, carbon cycle, economics, etc speak with no more authority on this subject than say Freeman Dyson. I define the 20th century detection and attribution field to include those that create datasets, climate dynamicists that interpret the variability, radiative forcing, climate modeling, sensitivity analysis, feedback analysis. With this definition, 75% of the names on the list disappear. If you further eliminate people that create datasets but don’t interpret the datasets, you have less than 20% of the original list". One degree in sixty years,really indicates that the issue is a pretend science, the fact of the matter is that, you don't need to be an environmental geek to understand that the human contribution needs to be checked and corrected most of the babyboomers have been trying to be environmentally responsible for our own actions for 40+ years. The reality is that the world we live in changes daily, however $24.00 a tonne will not alleviate the problem of global changes to the environment. Our heavenly oversee'er The Lord Jesus is the only supreme power that controls nature. Cardinal Pell has the right to express an opinion, religion and science have never been an integrated faith belief. After reading Cardinal Pell's presentation given in London,I sat down and wrote response which I sent as a Fax . I duly sent it off to Sydney.I received an acknowledgement from the Cardinal's Private Secretary last week.What really disturbs me is that Cardinal Pell is even commenting on an issue he is not qualified to speak about.While I can and do comment on Climate Change, having now studied weather and climate since school days now close to 50 years ago, I do not feel I can comment in any way on issues of Church Governance even though I hold a Masters in Theology.To me that is a Cardinal's prerogative. I totally support Tim's comments which I think are frank and fair. Well, Gavin, I hope, to be consistent, you also sent a fax of complaint to the Archbishop of San Salvador, who to my knowledge, is also not a climate scientist and so - on your criteria - not qualified to speak about this issue. And likewise to those members of the working group of the Pontifical Academy of Sciences who produced the report quoted by Dr Stephens who are not climate scientists (for example, one R Pachauri). Or does the knife only cut one way? Great article! It is embarrassing for Christians to have Dr Pell asserting his position as the "Christian perspective". As Stephens notes, there is no connection with Pell's views on climate change and anything remotely approximating theology. Isn't it marvellous how Pell's week (or fortnight) just keeps getting better, notwithstanding the title of this article? 1. For all their provisional status, the BEST conclusions, relied upon by Dr Stephens,are now determined as not contra Pell's thesis. Professor Muller himself now says: ‘I was saying you can no longer be sceptical about the fact global temperatures have risen over the past 50 years. There are other aspects of climate change which are still uncertain as I have made clear.’ Exactly what Cardinal Pell says. 2. There's the report in Science, as I mention above. Why aren't the erstwhile warmists dancing with the Cardinal in the streets? Surely they can't be actually desirous of global warming, just to prove their point? Why is it that most climate change deniers and conspiracy belivevers are also Christian(often Catholic), conservative and likely to vote Liberal? The answer is because the only believable response to climate change is radical change in consumption, energy usage and population policy. Pell represents the most reactionery voice in what is a crumbling Catholic Church in Australia which is quickly losing its traditional role as a power broker. The Greens will hasten this decline and hopefully we can all move on to a society free of the reactionery fear and moralising anti science typified by people such as Pell. It is never helpful to mix your ideology, indeed any ideology, into a discussion about facts, even controversial facts. Usually when this occurs the background ideology is undisclosed making its covert effect to censor or promote difficult to discern. Without the ability to discern any discussion is flawed.